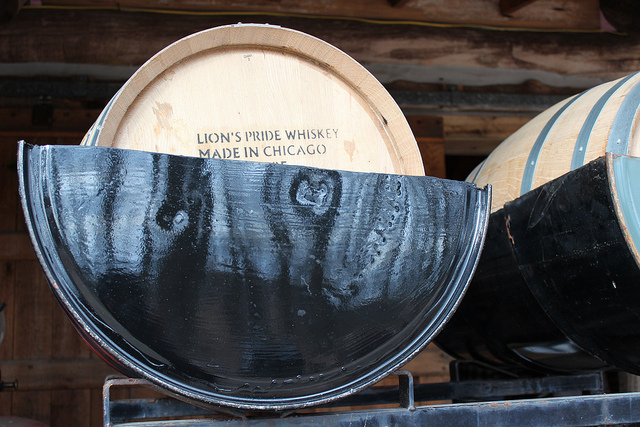 Is Indiana maple sap the next coconut water? At this very moment in Indiana, the one and only Tim Burton, maker of Burton&apos;s maple syrup, considered the best by Chicago&apos;s top chefs, is bottling what might become the next coconut water: maple sap. And it&apos;s not just a new food fad. In South Korea, rural villagers have been drinking what they call gorosoe for thousands of years during ritual spring festivals. I stole a taste of fresh maple sap as it dripped from a tree last Saturday at the National Maple Syrup Festival, a benefit for the Heads Up!!! Foundation, on Burton&apos;s Maplewood Farm in Medora. The flavor is barely sweet, some say like green tea, a so-called superfood to which it&apos;s been compared in this China Post story. 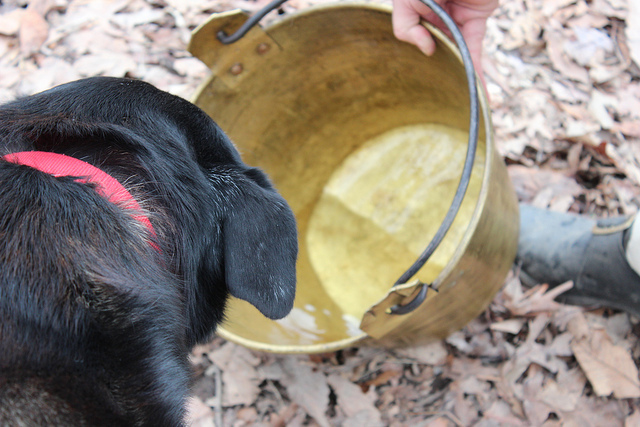 At this time of the year it takes about 40 gallons of sap to make one gallon of syrup. 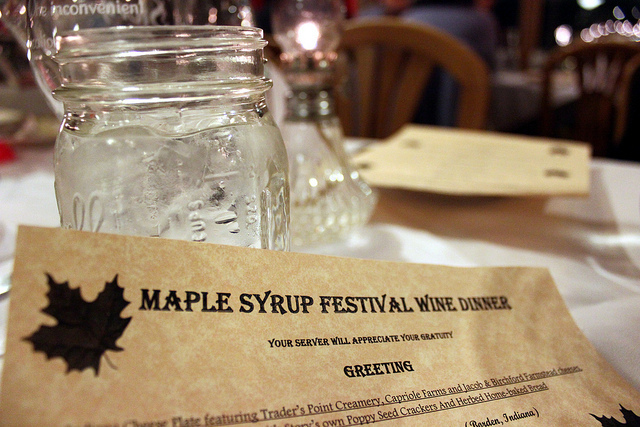 But first, we kicked off the festival weekend with a wine dinner at Story Inn. Story was founded in 1851 as a logging town. Now the entire tiny, unincorporated town is collectively a charming inn, restaurant, and host to the annual Indiana Wine Fair. During dinner, Burton told the tale of Jacob Flinn, his wife Angie&apos;s great-great-great-great-great-grandfather. Two hundred years ago today, on March 13, 1813, Jacob was captured by native American Pottawatomies. 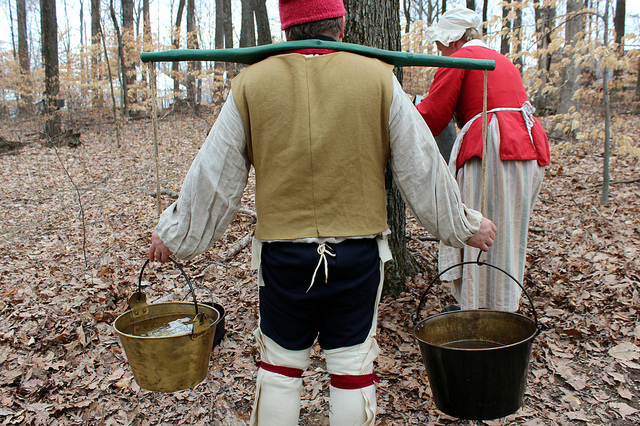 He carried with him a heavy kettle he used to boil maple sap. The full story can be found at the Lawrence County Historical and Genealogical Society in Bedford, Ind. — and on bottles of Burton&apos;s maple syrup. The morning after the dinner, I was one of the judges for the King Arthur Flour Sweet Victory Challenge. 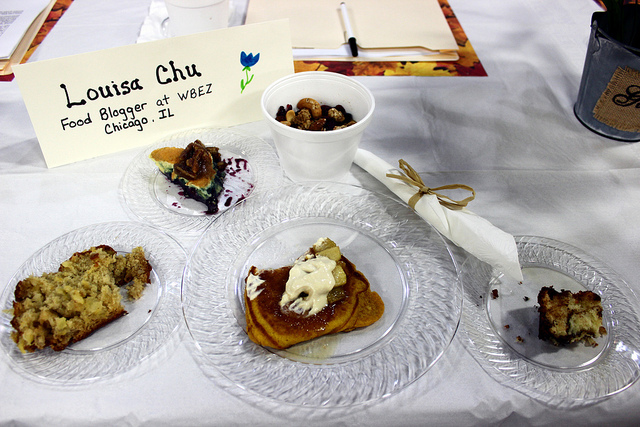 The winner for Adult Division, Breakfast: Spicy Pumpkin Pancakes with Maple Glazed Apples and Yogurt Topping by Gilda Lester of Millsboro, Delaware. But the challengers weren&apos;t all sweet. The Savory Adult winner, Maple Cranberry Sauce over Pork Tenderloin with Sea Salt Pancake Crisps, and the Youth winner, Chicken & Rooster & Waffles. Finally on the farm, native American camp interpreter Jeremy Turner celebrated his birthday with an 18th century cake called a Nun&apos;s Cake. 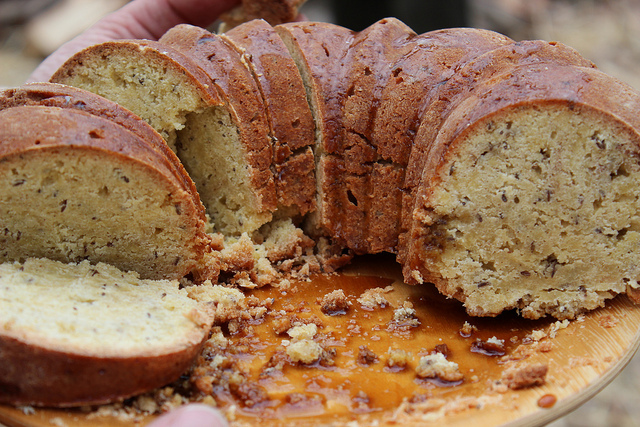 The rich pound cake with caraway seeds was made by Terry Sargent at the French camp from a historic recipe. At French camp Mike and Celia Tharp were just collecting buckets of sap. Mike offered my dog Kiba a drink. He said they give it to their livestock. In this country, only a few maple syrup makers are bottling sap, with one making carbonated maple sap. Burton says his bottled maple sap, Maplewood Mist, will be available starting this July at Green City Market. With the DIY soda trend I reported at the Housewares Show, you might make your own maple sap soda soon too. 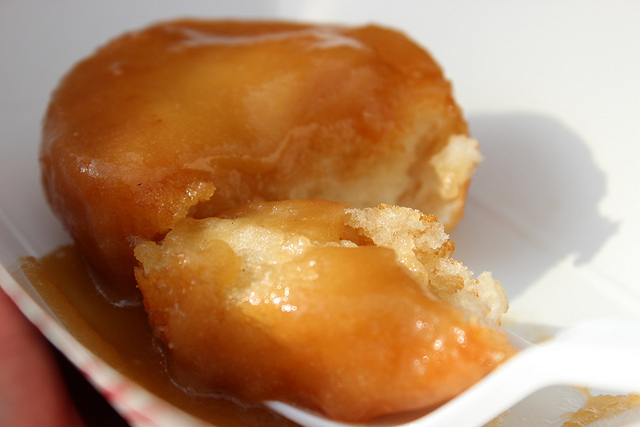 Watch the National Maple Syrup Festival 2013 slideshow.